Total Renovation Is Complete ! Completely Furnished & Accessorized ! Come and enjoy the natural beauty, peace and quiet of this established Charter Hills neighborhood in the exclusive Beech Mountain NC community. Escape the traffic of the big city, enjoy the safe, small hometown atmosphere and low crime rate in this upscale area..We are just a couple miles from town and just a mile to SkiBeech. This is the perfect summer retreat, second home or vacation rental investment. NC has long been a favorite vacation and retirement destination. 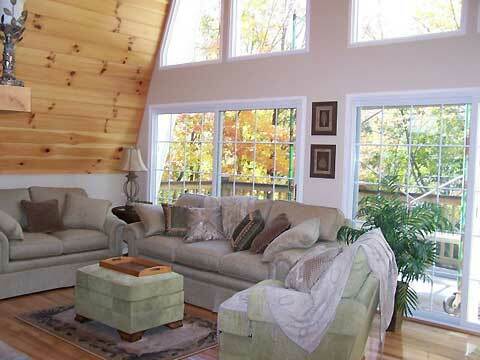 Ski Season on Beech Mountain NC at Ski Beech will be here before you know it...This is the perfect winter vacation home rental for that perfect ski trip. We have been working very hard and are now finished with the complete renovation of this home. EVERYTHING is fresh, brand new, top of the line, ultra elegant for your enjoyment! Beech Mountain, North Carolina has long been a well kept secret. It is a favorite family summer retreat, winter ski destination and great second home/investment location for many without the crowds of other mountain resort areas. Imagine your family enjoying 5 bedrooms, 3 baths, den/game room, jacuzzi tub, an unbelievable hot tub with waterfall and built-in stereo/CD player and much more. This luxury home is located in one of the most beautiful, scenic locations in the nation-the North Carolina Blue Ridge mountain high country. Perfect destination for a second home, summer retreat, winter ski getaway or lucrative vacation rental investment. This home is being sold completely furnished down to the dinnerware and linens! Look forward to hardwood flooring, top grade carpeting, high end appliances, granite countertop, three stone fireplaces with gas fire logs, top of the line heating/air system, new Elk architectural 50 year shingles, huge hot tub with stereo/CD player, tons of decking with six separate deck areas all furnished with comfy outdoor furniture, private balconies and patios from almost every room to enjoy the mountain air and scenery. You will feel as if you are in a mountain tree house looking out the front wall of windows. Perfect home for this natural scenic location. That's why we call it "A Heavenly Hideaway". The town of Beech Mountain, NC located at 5500 foot elevation has gorgeous views and the coolest summers that you could ask for. The average summer temperature is around 73 degrees, wow !! It is the highest town in eastern America, and is situated in the northwestern North Carolina mountains. The area is unique for its visual beauty, its distinct four season climate and its clean and safe environment, not to mention great winter snow skiing! 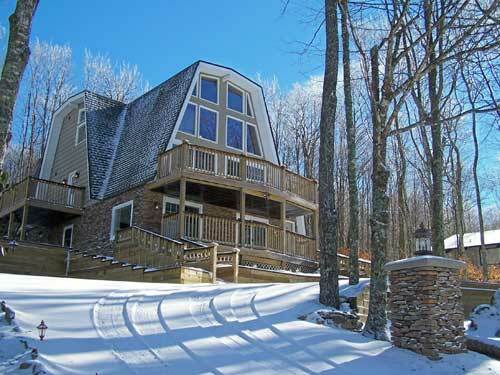 Beech Mountain, NC is located on Highway 184, approximately 25 miles from Boone and 5 miles from Banner Elk. Buckeye Lake is a seven-acre lake at the base of Beech Mountain, NC. It is a very popular recreation area with fishing, hiking, birdwatching and picnicking being favorite activities. Stocked with trout year-round! State fishing license required. With 15 slopes and 10 lifts, "Ski Beech" in Beech Mountain NC is a favorite winter destination for skiing, skating, sledding or snowboarding buffs. Ski Season is almost here. Our home is less than a mile to the Ski Beech slopes.. See http://www.SkiBeech.com for all the info... Check the site for rates for 2006/2007 ski season. Lots of ski specials also, Ladies Day Monday; Two for Tuesday; Retro Rate Wednesday; Men’s Day Thursday; and Bargain Nights for skiing. The kids can even go to the free sledding hill beside the Beech Mountain Town Hall starting soon, weather permitting! Great family fun. Sugar Mountain Resort with 20 trails and 8 lifts in Banner Elk also nearby. Appalachian Ski Mt in Blowing Rock is another choice. Whitewater rafting, horseback riding and hiking on the waterfall trails of the Blue Ridge are very popular activities as well. Beech Mountain has 18 miles of maintained trails that wind across the mountain amidst the abundant wildlife. Our Beech Mtn home is also just a short drive from many of the well-known family attractions, such as Tweetsie Railroad, Grandfather Mountain, Linville Caverns, Mast General Store, outlet shopping in Blowing Rock and more! Lees Mcrae College and Appalachian State University are nearby as well. Scenic mountain sightseeing, hiking, golfing, fishing and shopping will certainly keep you busy, but there is nothing like just taking in the fresh mountain air while sitting on the deck or cozied up to the fireplace during the first snowfall, ahhhh !!! Your family will love this spacious, unique home. Three Levels of Comfort.. 6 New Decks...Stacked Stone... Quality Workmanship. 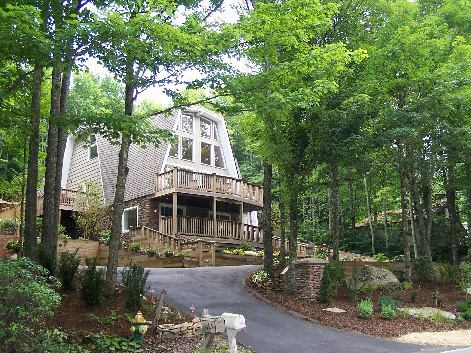 Beech Mountain NC is home to a very unusual treasure - The Land Of OZ !! In the past eight summers, OZ has gone from being an "archeological dig" to an enchanting private garden, with Dorothy's farm restored, gazebos renovated, fountain, pond and waterfall made operational, and the yellow brick road unearthed and patched. For now, the character houses and Emerald City are gone. But each summer we add something back to OZ. Sometimes it is original items returned to us from caring friends. One of my proudest moments was hauling back to OZ what I believe to be the very last balloon in existence.